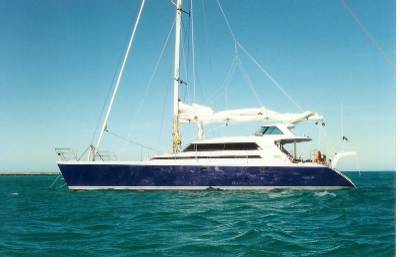 This spacious sailing catamaran yacht design represents the pinnacle of luxury in this class of boat; coupled with performance under sail and power that will not disappoint even the most discerning owner. The interior volume is comparable with many 65' catamarans and 75' monohulls. 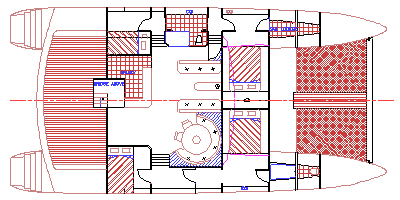 With a main saloon area of 5.2m x 5.2m (17' x 17') the living area compares favorably with many exclusive apartments, in fact the owner of the original boat sold his city residence because it became redundant once the boat was launched. The Galley facilities are located adjacent to the main living area and are more akin to the kitchen in a modern town house than those often found on sailing yachts. Several layouts are available and can accommodate up to eight guests in four staterooms with options for two to four generous bathrooms. The helm is located in a dedicated station raised above the main deck and affords good all round vision, protection from the elements, a convenient nav station and sailing controls allowing comfortable single handed sailing with plenty of space for two to share the sailing duties if desired. A large covered aft deck is kept free of ropes and sailing controls, making it the perfect place for outdoor entertaining or just enjoying the view. A powerful rig provides good performance under sail with owners reporting sailing speeds in excess of twenty knots and excellent race results. For those who don't like to wait to enjoy their destination, powering options offer speeds close to twenty knots even when there is no wind.